Its official, the roof is on, the windows are in, the interior work will now commence in earnest. 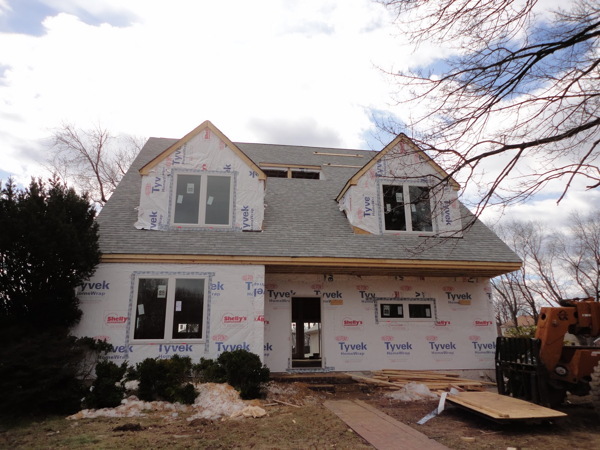 Seems like just yesterday we were trying to imagine what the house would look like when the roof was framed, and here is all shingled up, all those wall holes filled with windows, and looking all very housey. Well we have some treats for you today, because if you follow the link below not only will you find the usual selection of further images of the progress of the construction, but also two wonderful videos that the owner has made of a short walk-thru of the house. Its still all just framing inside, but there is no better way to finally understand the collection of rooms and spaces shown on a floor plan than to take a little stroll through them. So click on dear reader..